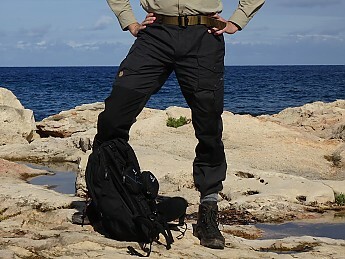 Rugged and practical hiking trousers with multiple pockets. Not suited for warm weather but excellent from fall to spring. The Barents Trousers by Swedish brand Fjallraven are tough and practical, with a reinforced seat and knees and seven pockets. 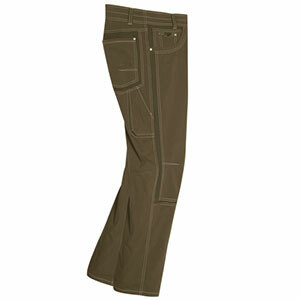 The Barents Pro Trousers are a variation on the same design with a slimmer cut and minor changes to the pocket layout. Initially I ordered the Barents Pro trousers because Fjallraven describes this model as having a regular cut, and this is what I wanted. 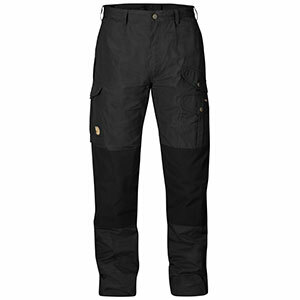 Fjallraven says that the Barents trousers have a high waist and a comfort fit, which I thought meant baggy. But when my Barents Pros arrived I found them to be low-waisted and tight-fitting. A couple of months later I was abroad and I was able to try on the Barents in a store. I found that, in spite of Fjallraven’s description, this model was what I would consider a regular fit. So I decided that the Barents were the trousers for me. Before making my initial choice I had scoured the web for comparative information about both models. I found reviews of each one aplenty but no direct comparisons of the one versus the other. So now, having had both, I can compare them myself in the hope that others will be in a better position to choose between them than I was. This is what I will do here, even though I am uploading this piece as a review of the Barents. I will start with the pockets because they are the main reason I bought these trousers. I live in Malta, but I wanted the trousers mainly for walking holidays abroad — the sort of trip where I would be constantly referring to a guidebook and possibly a map. I wanted to be able to keep both documents in my trouser pockets for quick access, but this was not easy to do with my normal hiking trousers. My Craghoppers Kiwi Classics have only one cargo pocket. 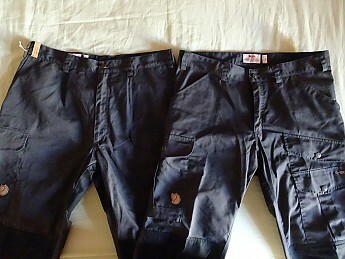 My 5.11 Strykes have two, but none deep enough for a map—a pity, because these are superbly well made pants. The Barents and Barents Pros have three cargo pockets, one on the right leg and two on the left. 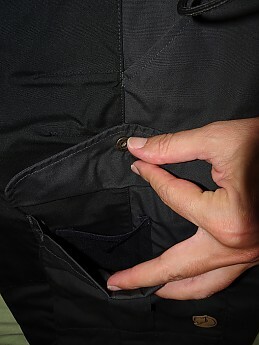 The deepest pocket is the upper left, which goes all the way down behind the lower left pocket and can easily swallow a map. 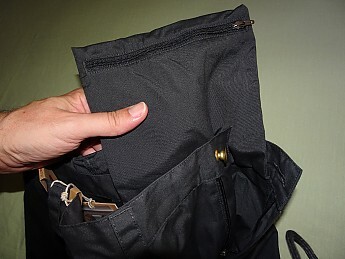 The right pocket is not as deep, but it is still big enough to accommodate most guidebooks. The lower left cargo pocket is smaller but still useful. Each cargo pocket fastens with a single brass stud – an arrangement I find more practical than either buttons or velcro. There are two hip pockets and, in addition, an axe pocket behind the two cargo pockets on the left leg. The hip pockets are quite deep. The axe pocket opens from both top and bottom, the idea being that you can slide your axe haft through and let the head (sheathed, of course) rest on the pocket lip. I don’t use an axe, but I do use a Joby Gorillapod Original mini-tripod for my camera, and it fits perfectly inside the Barents axe pocket. The left trouser leg of the Barents laid over that of the Barents Pro, with cargo pockets and axe pocket visible. The Barents has a deeper axe pocket than the Barents Pro. The Barents model has a zipped security pocket on a flap attached to the inside of the waistband. This feature is missing on the Barents Pro. On the other hand this model has a mobile phone pouch inside the right cargo pocket. Neither the Barents nor the Barents Pro has back pockets, but this is not a problem for me because I rarely use the back pockets on any of my trousers. Both models are made from Fjallraven’s trademark G-1000 fabric. This is a densely woven 65 per cent polyester and 35 per cent cotton blend. Fjallraven describes G-1000 as tougher than denim, water-resistant, virtually windproof, highly protective against sunburn, and mosquito-safe. Fjallraven also sells a product called Greenland Wax which can be applied to the fabric to increase its water resistance. The fabric certainly does look tough. I have not yet tested the trousers in the rain, but they do cut out wind. Unfortunately, they are also warm. I tried them out on a day when the temperature in the shade was 18°C (64°F). I felt comfortable walking under an overcast sky, but when the sun came out my legs started to get sweaty. These trousers are not for hot weather. On the other hand I tried them out on another occasion in bad weather when the temperature was 13°C (55°F), and I was comfortable even though I was wearing a pair of Berghaus Paclite overtrousers over the Barents. 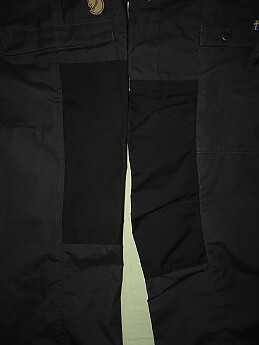 As material goes I prefer the polycotton ripstop of my 5.11 Stryke trousers. 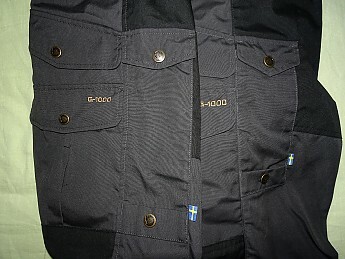 It has a degree of stretch to it which Fjallraven’s G-1000 lacks. It is tough, yet not as heavy as Fjallraven’s G-1000, so it is more versatile weather-wise. Strangely enough, though, the Barents trousers are lighter than the Strykes. They weigh in at 553g (19.5oz) compared to 722g (25.5oz) for the Strykes. 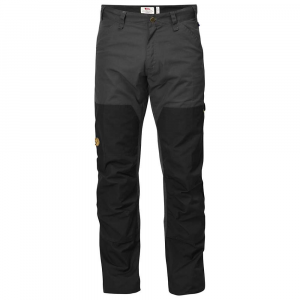 The Barents and Barents Pro pants come in European sizes, although Fjallraven provides a conversion chart. Size 50 is given as equivalent to 33–34. My Craghoppers Kiwi Classics and 5.11 Strykes are both in size 34 and they fit me equally well, even though US sizing is said to be more generous than European. So I ordered both the Barents Pros and the Barents in waist size 50, and in both cases the size turned out to be spot on. Getting the size right is important because neither model has an adjustable or elasticated waist. It was below the waist that the fit of my Barents Pros proved problematic. I found these trousers uncomfortably tight about the hips and crotch. They were so close-fitting that whenever I put my hands in the hip pockets and took them out, I drew out the pocket lining. 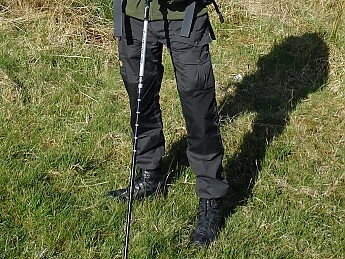 I tried walking in these trousers to see if I could get used to them, but I was always conscious of their tightness and I could not imagine sleeping in them on camping trips as I had done with my other hiking trousers. The Barents model has a more relaxed fit, thanks in part to pleats on the front, and I found it altogether more comfortable. Furthermore, the Barents trouser legs are appreciably wider than those of the Barents Pro. This makes them easier on the knees during ascents, even though the Barents Pro model has articulated knee panels while the Barents does not. 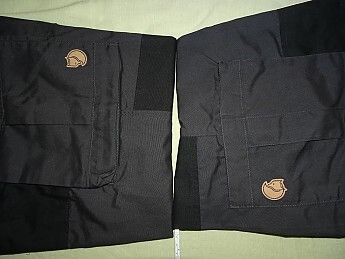 Trouser legs of the Barents (left) versus the Barents Pro (right), folded at the mid-points and placed next to each other for comparison. The Barents trouser leg is about a third of an inch wider—enough to make an appreciable difference in comfort. Trouser legs of the Barents (left) and Barents Pro (right), laid against each other lengthwise. The Barents Pro knee panel is articulated and set lower down, in a better position than that of the Barents. Also, it has an opening at the bottom for a knee pad, a feature the Barents lacks. Both models come in raw length, meaning you have to get the trouser legs hemmed to suit you. Fjallraven produces alternative models called the Vidda and Vidda Pro which are similar to the Barents and Barents Pro but with hemmed legs. The Vidda and Vidda Pro have elasticated straps with studs on the hems so you can tighten them over your boots. But I wanted uncluttered hems because I like to tuck my trouser legs into my socks when walking on wet or muddy ground. This is why I opted for the Barents Pro and later the Barents. I would rate the Fjallraven Barents and Barents Pro as highly as the 5.11 Stryke in terms of manufacturing quality. The stitching on each Fjallraven model is less obtrusive than on the Stryke, with less visible bar-tacking and double-stitching. All the same, the Barents and Barents Pro look and feel highly durable and, as with the Stryke, there is not a thread out of place. The waist on both the Barents and Barents Pro fastens with a single jeans-style rivet button, but it looks and feels secure. The fly zip on both models is made by YKK. Each has eight belt loops, which are wide enough for a 1.75 inch belt. 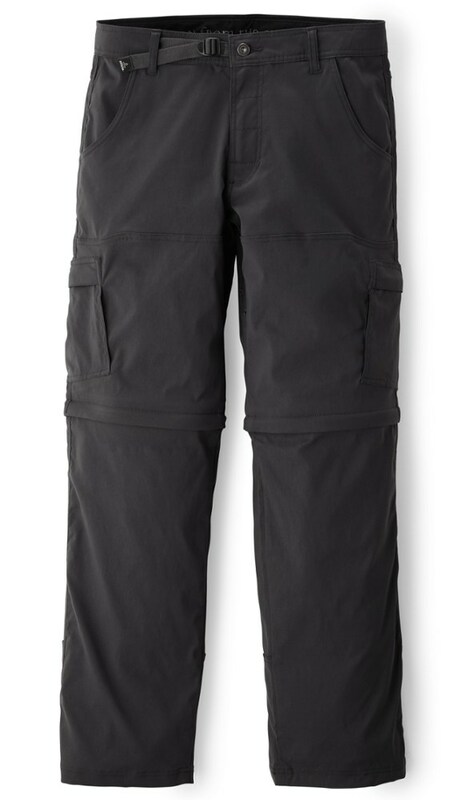 To sum up, I was disappointed with the Barents Pro trousers because of the tight fit but I am happy with the Barents. 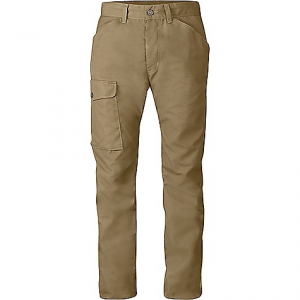 They are tough and, thanks to those pockets, highly practical. I have to admit that I like their looks too. They have a sort of rugged elegance and they look the part of outdoors trousers, but in an understated rather than an in-your-face way. My pair is dark grey with black panels, and the muted contrast between the two colours contributes to the understated look. My only complaint about these trousers concerns their warmth. If they were made of a lighter material they would be suited to a wider temperature range. In a warm country like Malta they are only good for winter. Still, I like the Barents so much that I’m keeping them. I bought them mainly for use abroad, and they should be excellent for walking holidays in colder countries in the spring or fall. Because I have made limited use of these trousers so far, I cannot comment on their durability beyond saying that they look tough. I will update this review in future if I have anything to add on this point. Last month I wore these trousers on an eight-day trek in Scotland. I walked in temperatures varying from 12 to 15 degrees C (54 to 59 deg F). These are temperatures in the shade: it would of course have been hotter in the open when the sun was out. The trousers were comfortable most of the time. But they did feel warm occasionally when the sun was out, or when it was raining and I had to wear overtrousers. I came to feel that conditions during my Scottish walk were at the upper limit of the temperature range for which these trousers are suitable. They are ideal for cooler temperatures. The lack of stretch in the trouser fabric was a drawback during steep ascents. I particularly did not look forward to steep ascents when it was raining and I had my overtrousers on. There were moments when I contemplated wearing my overtrousers on their own. Barring ascents, the trousers served me well. I wore my Barents every day, and most nights I slept in them too. The only visible effect is some discoloration in the seat, but otherwise the trousers look as good as new. I can vouch for their durability. I can also report on how these trousers perform in the rain. I wore them in the rain for the first time in January 2017 and I was impressed with their water repellency. I was able to walk for a considerable period in light rain and I was only compelled to put on overtrousers when the rain intensified. However, washing these trousers considerably reduces their ability to repel rain. You can restore it by applying Greenland Wax, but I'm not keen on this. There is a tradeoff between water repellency and breathability, and in the light of my Scottish experience I consider breathability more important. If the trousers get wet, they dry very quickly indeed. On one occasion during my Scottish trip I gambled on not putting on overtrousers during a shower. The shower turned into persistent heavy rain and my Barents got soaked. Then the rain stopped and the sun came out, and the trousers dried on me within maybe a quarter of an hour. Thanks for the info and review, Charles. I hope you'll keep us posted on how these pants continue to work out for you. 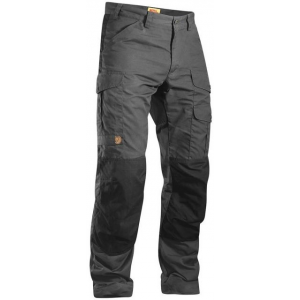 The Fjallraven Barents Trousers is not available from the stores we monitor.